Norm Sherry played professional baseball for 16 years, and coached or managed for decades more. As a player, he spent four of his Major League seasons with the Los Angeles Dodgers (with brother Larry Sherry), and a year with the New York Mets. He was named California Angels field manager in 1976, following five years as a minor league manager and pitching coach in the Angels organziation. Sherry, a catcher, joined the Dodgers in 1959. With brother Larry, a pitcher, he not only made up one-half of Major League Baseball’s rare siblingbattery duos, but Norm was a contemporary of Sandy Koufax. His savvy is credited with helping to develop Koufax into a Hall of Fame star. 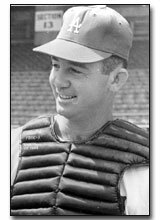 Norm’s best season as a player was his sophomore year (1960), when he hit .283 with eight home runs as backup catcher for the Dodgers. His first home run gave brother Larry a victory. He has been a pitching coach for San Diego, Montreal and San Francisco. In 1984, his young Padres mound squad won the 1984 National League Championship. With the Giants for six seasons, the team twice achieved the best earned run average (ERA) in the Majors, in 1987 and 1989.